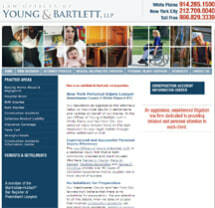 At the Law Offices of Young & Bartlett, LLP, we believe there is no substitute for preparation. Part of our preparation comes in the form of work we do outside of our law office. By gaining an understanding of the world around us and how the justice system affects "everyday people," we are able to bring this experience to our clients. Attorney Francis X. Young has been litigating personal injury cases throughout New York since 1984. He was trained by two of New York's most talented and respected lawyers: Francis J. Young and Louis D. Broccoli. Attorney Mayo G. Bartlett is heavily involved in community social justice and non-violent efforts.